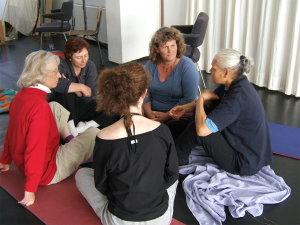 The fifth Amsterdam International Feldenkrais Teacher Training (AIFTT V) starts in November 2016. The following pages introduce our program, explain its design and benefits, tell you about the logistics, and let you know how to apply to the training. We are committed to offering a program that will prepare you to be a competent and effective Feldenkrais teacher. Before delving into the details, I’ll tell you about our innovative and comprehensive approach to becoming a Feldenkrais teacher. We have designed a program to build on the innovation begun by Dr. Moshe Feldenkrais, incorporating everything we’ve found out about the training process since his death over thirty years ago, especially what we’ve learned about what it takes to prepare you to practice the method. We meet quarterly so that you have time to build your skills and understanding incrementally and time to integrate what you’re learning. The AIFTT V curriculum offers a balance of experiential and cognitive learning by integrating innovative classroom teaching with one-on-one guidance, interactive dialogue with state-of-the-art online support, and personal growth with professional development. Working in class and studying at home, learning alone and with others, slowly but surely, step-by-step, the training cultivates the keen observation, refined touch, nuanced communication skills, and strategic reasoning of a Feldenkrais teacher. The beginning of the fifth Amsterdam training will overlap with the end of the fourth training. That means, for the first time ever in the history of Feldenkrais teacher training, you have a chance to witness – and perhaps even serve as one of the model students for - the final hands-on practicum of the soon-to-graduate trainees. You will get to sit in on the feedback sessions and participate in some of the last classes of the training that’s about to finish. You’ll start your learning at the end of the previous training, giving you an unprecedented and unique perspective on what it means to become a Feldenkrais teacher. Interested in finding out more about the AIFTT V? Sign up receive updates about the program and get free access to our Training Test Drive, which includes the recordings of the first week of the AIFTT III. Find out what makes our programs inspiring and unique . . . and figure out if it’s the right training for you. 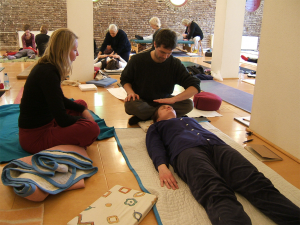 I invite you to read the following carefully as you consider whether the fifth Amsterdam International Feldenkrais Teacher Training is the right professional training program for you. Lawrence Wm. Goldfarb, CFT, Ph.D. 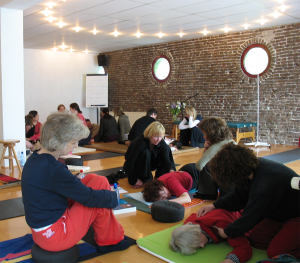 The Sixth Amsterdam Feldenkrais International Teacher Training will begin in May 2020. Please sign up above to be added to the mailing list. What makes the AIFTT V special? The beginning of the training overlaps with the end of AIFTT IV so you get to see how a training ends, get to know the soon-to-graduate trainees, observe their hands-on practicums with public, and attend the feedback sessions. The curriculum is built around meeting four times a year, allowing for incremental, step-by-step, progressive development of observational skills, teaching abilities, and theoretical understanding. Rather than being limited to the outdated "lose your mind and come to your senses" of the trainings of yesteryear, the training teaches to explicit logic of learning so that you come to understand the how and why of the method. The program is built from the ground up to reproduce the learning the journey of the founder and support you in applying the method to your life. Be ready to teach classes and give hands-on lessons by the time you graduate. Let’s take a deeper look at each of the educational approaches we use in the AIFTT V.
During the training, you’ll do two Awareness Through Movement (ATM) lessons nearly every day. Most of these ATMs will be drawn from the training programs that Dr. Feldenkrais conducted and the public classes he taught while the rest come from recent developments in the method. So that you will get the most benefit possible from doing ATM, you begin the training by developing your personal practice of the method. Then, after spending time simply experiencing the lessons, you begin an interactive, lively investigation into how and why ATM works, one that continues over the course of the entire program. This way you have ample time to develop the understanding of lesson structures and strategies needed to become a good teacher. Because it is important for you to know the full spectrum, you’ll experience everything from simple introductory lessons to intricate series of interwoven ATMs. Because it is not enough to read a lesson, you learn how to effectively engage and respond to students, as well as how to talk about and promote the method. You’ll learn to teach short mini-ATMs as part of lectures and demonstrations as well as how to present super short five-minute miracles to quickly and effectively communicate the efficacy of the method. Because we don’t artificially separate Awareness Through Movement from Functional Integration (FI), you’ll learn how they are just two related aspects of the method, two sides of the same coin, each one illuminating the other. No matter what others say, to truly understand the method and practice it well you need to understand the skeletal design of the human body. In the AIFTT, you learn anatomy and biomechanics experientially: through your experience of doing ATM, by touching other students, and by “riding along” while someone else moves. You develop your tactile and kinesthetic acuity by doing ATM lessons and completing assignments in small groups. To understand the teacher’s perspective, trainees coach each other in practicing hands on skills and, eventually, giving FIs. Peer supervision provides the basis for giving lessons to the public and prepares you to give lessons under faculty supervision. All along, you receive the feedback necessary for refining the touch that teaches. As part of the training, you’ll receive at least three individual Functional Integration (FI) lessons each year at no extra cost whatsoever. Receiving these lessons – given by members of your trainers, assistant trainers, and other highly experienced teachers – is a central aspect in becoming a good teacher. On top of that, you observe lessons given during class, watch lessons given to your fellow trainees during non-class hours, and review the hours of videos provided free in the training’s online multimedia library. You take part in regular discussions, both in small groups and with the entire class. These discussions vary in style from question-and-answer periods, dialogues, open-ended talks, and conversations oriented around specific topics. They give you a chance to grapple with difficult questions – those without pre-determined answers – and actively investigate them, learning how to deal with novel situations by employing Feldenkraisian reasoning. Working in small groups gives you the chance to learn from and with your classmates. They are crucial to developing the understanding and skills needed to teach FI and ATM. In these groups you’ll be doing assigned activities such as observing a particular movement, practicing a specific technique, or analyzing a lesson. For example, in preparation for teaching an ATM lesson at home between class segments, you’ll plan how to present the lesson and practice teaching sections to each other. We are committed to creating a constructive atmosphere for learning and small groups play a central role by creating a place where each trainee can speak and be heard. They also give you a place to discuss the training process, reflect on what you’re learning, identify difficulties, and develop solutions. By drawing on the different skills and background that each member brings, the group becomes a place for collaborative interaction and cooperative learning. We expand beyond the idea of being in a group to learning with a group. During the third and fourth year, you participate in a community-based ATM teaching project. For this project, you prepare a class or, optimally, a series of classes for some group or institution in your community. In this way, while still developing your skills, you have a student teaching situation for testing your abilities, getting feedback, and continuing to improve. The project gives the opportunity to put what you learned to work for the benefit of others, serves as a stepping stone to being paid for teaching classes, and, therefore, provides an important step in becoming known as a Feldenkrais teacher. Trainees work on the plans, curriculum, and presentation in study groups and with the faculty, thereby giving us another means for keeping alive the topic of the learning of how to teach ATM better beyond the second year of the program. So that we can track your progress through the program, the educational director and faculty get to know each trainee. Observing the ways you learn, interact, and practice in class day by day, gives us the overview needed to assess your progress and nurture your development. That means that supervision, in the sense of watching and guiding, is an ongoing aspect of the program. We will be initiating a Big Sister/Brother program where you invite a Feldenkrais teacher you know to be your personal mentor. In exchange for working with you regularly, answering your questions, and supporting your learning, this teacher will be given access to selected recorded materials and homework assignments so that he or she can follow and support your progress throughout the AIFTT. To facilitate your personal learning further, Larry Goldfarb, AIFTT’s educational director, is available to answer questions, discuss your learning process, and provide support via email and virtual office hours. He follows your learning to identify subject areas or skills that need work and to map, in close collaboration with you, a personalized strategy for your development, including individual assignments for learning between segments. The training is designed to facilitate continuous, incremental learning. That means that we are committed to making sure that the intervals between training segments are utilized as part of your ongoing personal and professional development. To that end, we encourage you to take ATM classes and workshops offered by your local teachers during the interim periods. In this way, you can learn about different styles of teaching and begin to interact with future colleagues. For the same reasons, we also suggest that you receive FIs between segments. To keep in touch with other trainees and to keep the learning process alive between segments, we ask you to participate in regular study group meetings. These study groups provide a place to do ATM, practice teaching and touching, discuss questions, prepare lessons, and continue learning outside of class. To deepen your understanding of the method and to strengthen your ability to express that understanding, at the end of each training module we offer both individual and group homework. These assignments include asking you to read articles and books, do movement observation exercises, techniques, experiment with ATM teaching, practice hand-on work, and refine your analytical abilities and communication skills by writing. You can access and download the audio and video recordings of the entire training for free via our online multimedia library, which provides another way to continue learning between segments. We are constructing an online school that will allow you to share your experiences, realizations, and questions with the other trainees and to get support from the faculty. It’s wise to consider the expenses above and beyond the course tuition. Please realize that becoming a Feldenkrais teacher means purchasing books and other educational materials. You might also want to budget for classes and individual lessons outside of the training. Finally, you’ll need to purchase a Feldenkrais table along with rollers, pads and a stool, which can cost anywhere to €700 to €1,500. What is the training curriculum? From the beginning of training, you start the process of learning through your own experience by doing Awareness Through Movement® (ATM®) lessons. In the first segment, we teach the classics, the lessons that Dr. Feldenkrais relied on most in his lectures and public workshops. For the rest of the first year – and all of the second – the ATMs will map the way coordination and skill matures from infancy to independence. Retracing the ways children learn by exploring the patterns of development gives you chance to move beyond your personal history while revealing the very processes that underlie human learning. To become a movement detective requires developing and refining your ability to observe with your eyes, hands, and ears. Observing yourself and others, in class and between segments, develops your sensory acuity. You will be studying and applying the SPIFFER model, an explicit framework for investigating movement and understanding the mover. You’ll also begin learning basic NLP models and skills – ways to better understand and communicate with others. In addition you start learning the hands-on work, known as Functional Integration® (FIsm) lessons from the beginning. Because we believe it takes time to become proficient, we don’t wait until the second or third year of the training. You practice and refine the essentials of teaching through touch – skeletal contact, tactile tracking, and directional touch. So that you don’t hurt yourself helping others, you also begin to learn develop effective self-use, meaning how to move safely and effectively as a teacher. Building on the ATMs from the first year, we continue the developmental theme, moving past the motions of early infancy to explore locomotion and other more complex skills. So that you will be ready to begin teaching ATM at the end of the second year, you study the grammar and syntax of lessons. You practice and improve the skills an ATM teacher needs, including how to give instructions and guide a group, how to plan and promote a class, and how to make lessons relevant to daily life. And you’ll learn the non-verbal and linguistic of patterns of effective communication. Since giving a good FI requires being able to teach ATM well, and vice versa, we interweave the teaching of these two modalities. The emphasis is not on learning to move others, but on you developing awareness of – and skill in – moving yourself to move someone else. The skills to teach classes and to give hands lessons are fostered in pairs and interactive small groups, providing ongoing, real-time support and supervision. The second year ends with an ATM teaching practicum during which you receive individual feedback about your abilities and personal guidance in how to continue to develop them. By successfully completing this process, you earn a certificate to teach ATM classes to the public. You continue to connect more of what you’re learning about yourself doing ATM to understanding the method and teaching it. Because you have been simultaneously cultivating verbal and hands-on teaching skills from the beginning of the program, we avoid the historically difficult transition from learning to teach ATM to learning to give FIs. Through structured sequences of assignments, your movement observation and hands-on skills continue to improve. In order to foster real understanding and move beyond simple paint-by-numbers lessons, we explore similar themes in different positions and from varying perspectives. You learn how to help others recognize and remove the obstacles that interfere with continued improvement by facing your own roadblocks, plateaus, and dead end. We give you assignments designed to enhance your problem-solving skills and critical thinking abilities, such as translating an ATM into an FI or finding new ways to do things you already know how to do. Because we know it takes time to become a competent and captivating ATM teacher, you continue to develop your teaching abilities and presentation skills throughout the third and fourth years of your training. Doing a community project gives you a trial run at preparing, polishing, and presenting a free public class or workshop with the full support of your study group and the faculty. You gather the students’ feedback and review it with the Educational Director, reflecting on what worked and what didn’t . . . and figuring what you need to learn next. In this way, you learn to become a reflective practitioner at the same time as you start to teach paid classes and workshops. You’ll do more complex and challenging ATMs, including lessons based on the martial arts roots of the method. You have many chances to develop your coordination in surprising and delightful ways. You’ll continue to improve your own abilities at the same time as you learn more about helping others improve theirs. You develop the ability to give lessons by getting better at the full range of Feldenkraisian strategies, schemas, scenarios, and skills. Now that you and your classmates understand the underpinnings of the method, you supervise each other giving FIs. After learning to give FIs in the first three years, the fourth and final year gives you the opportunity to become a better functional integrator. It’s time to bring together the models you’ve learned, the ways of noticing you’ve developed, and the skills you’ve honed. We’ll go into further depth with the repertoire of lessons you’ve learned while also refining your ability to find lessons and modify them – or create them – to fit your students’ needs. Building on what you’ve already learned about articulating and presenting the work, we challenge you to continue improving how you talk about and teach the method. You delve deeper into what makes a lesson a Feldenkrais lesson and into what makes our lessons meaningful and memorable. Reflecting on your personal learning journey – and taking into account what you witnessed of how classmates traveled through the training and all you learned from being a part of their passages – prepares you for understanding and working with the many ways people learn. You’ll learn to recognize and effectively and compassionately respond to different learning styles as you master different teaching strategies. To receive individualized feedback and attention, you collaborate with your classmates, learning from and with each other while, at the same time, also receiving personal support and assistance from faculty. The training ends with an FI practicum during which you are supervised by the faculty giving lessons to people from the general public. This serves not so much as a test, but more a way of getting recognition for what you’ve learned, building on your competence to develop confidence, and serving as a launching pad for your new career as a Feldenkrais teacher. Built on reclaimed marshland, Amsterdam has become one of the most beautiful and well-known cities in Europe. A historic center for learning, trade, and transportation, Amsterdam has the characteristics both of a vibrant cosmopolitan metropolis and an intimate, international village. Known for its canals and charming architecture, Amsterdam is a thriving modern town with a rich cultural heritage. 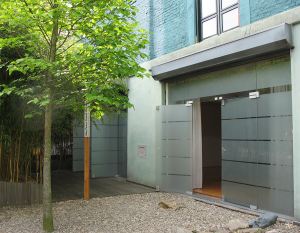 The AIFTT will be held at De Ruimte, located at Weesperzijde 79 a. 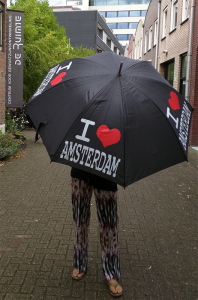 One of Amsterdam’s centers for personal development and professional development, De Ruimte offers a beautiful, comfortable setting for learning just a few steps from the Amstel River and only a few minutes walk from shops, restaurants, and public transportation. Over the years, through the contacts we’ve developed in the local community, we have compiled a small list of affordable lodging. As a way to support the development of the Method, these Feldenkrais teachers, their friends, and friends of Feldenkrais offer a room in their apartment or house to rent for considerably less than the going rate. Please get in touch with Rina at [email protected] if you’d like to find out more. www.bedandbreakfast.nl with 40 reviews that are at least 7 stars or higher, this is the number one on our list. www.hotels.com 30 reviews average of 3 stars and higher. www.booking.com At least 40 reviews 7 stars review. One more option: We made special arrangements with the venue and AIFTT V trainees may stay at de Ruimte for an incredibly low nightly charge that we is offered only via email. Please contact Rina, [email protected]. When is the training scheduled? o This schedule is subject to change due to the availability of faculty or sites. o Whenever possible, the trainee will be notified of any changes via e-mail or post at least 60 (sixty) days in advance of said change. Friday to Sunday, class is held from 13:00 to 19:00. On Monday, class meets from 10:00 to 17:30. On Tuesday, class meets from 9:00 to 13:30. *Five segments include a week consisting of 6 days instruction, running from Thursday to Sunday. These are always during the first week of the segment. On Thursday, class meets from 12:00 to 18:30. The five extra days plus the 31 five-day weeks add up to the 160 days of instruction required by the EuroTAB accreditation guidelines. For every hour of scheduled class, we ask you to commit a minimum of two hours to learning outside of class. This makes for a total of at least 1,600 hours over the three years of the training. This time is meant for reading, doing homework assignments alone and in study group, reviewing the recorded materials, practicing teaching classes, and doing hands-on work. The fifth Amsterdam International Feldenkrais Teacher Training (AIFTT V) maintains the high standards of an accredited training of the European and Israeli Feldenkrais Training Accreditation Board (EuroTAB). All Feldenkrais trainers and assistant trainers on the training are certified by the EuroTAB. AIFTT V graduates meet all requirements to join the Feldenkrais teacher association or Guild anywhere in the world. 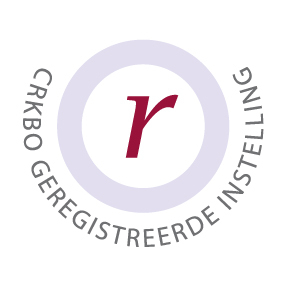 Our teacher training program has been registered with the “Centraal Register Kort Beroepsonderwijs” (CRKBO). Therefore, the AIFTT V is officially recognized by the EU as vocational training and, consequently, tuition is exempt from the BTW, the Dutch Value Added Tax. Our teacher training program maintains the high standards of an Approved Training Program of the International Somatic Movement Education and Therapy Association (ISMETA). AIFTT V graduates meet all requirements to become Registered Somatic Movement Educators and Therapists. 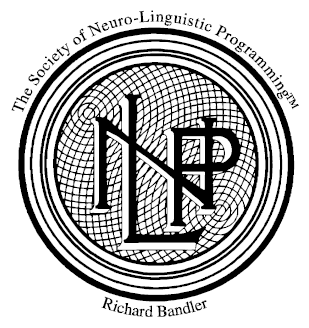 The Neurolinguistic Programming training that’s woven into the fifth Amsterdam International Feldenkrais Teacher Training (AIFTT V) is approved, endorsed, and certified by the Society of Neuro-linguistic Programming (SNLP). Graduates of the AIFTT V are eligible to be licensed as practitioners and master practitioners by the Society, which is only NLP organization authorized to grant licenses. The European Feldenkrais Accreditation Board (EuroTAB has accredited the fifth Amsterdam International Feldenkrais Teacher Training. The EuroTAB is one of four such Training Accreditation Boards in the world, with one in the US for North and South America, one in Germany for German trainings, and the other in Australia for the Pacific. 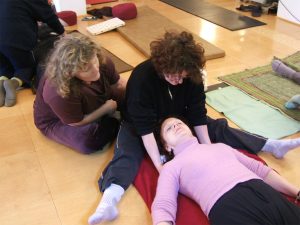 Together, they administer the International Feldenkrais Training Accreditation Policy. The training needs to consist of 800 hours over 160 days. The faculty of the training, including Educational Directors, Certified Trainers, and Certified Assistant Trainers, must be certified by one of the TABs. Student—teacher ratios fixed to ensure individual attention and personal education. Minimum numbers of individual sessions in Functional Integration® each student must receive is included in the tuition of the training. The teachers who give these lessons are required to be sufficiently experienced and qualified as well. These standards provide important assurance that trainings will adequately meet the needs of their trainees. By establishing this accreditation process, the Feldenkrais community has created critical consumer protections for participants in professional training programs. We are proud to have received this accreditation and to uphold these standards. As a matter of policy and procedure, all Mind in Motion training programs meet or exceed all accreditation criteria. How big is the training? To ensure personal attention and make it possible to support your individual learning process, the AIFTT V has a strict limit of a maximum of 32 trainees. The educational director of Amsterdam International Feldenkrais Teacher Training, Lawrence W. Goldfarb, CFT, Ph.D., is an international lecturer, multimedia author, movement scientist, systemic specialist, and trailblazing teacher based in Santa Cruz, CA. He integrates what he learned from Moshe Feldenkrais and Heinz von Foerster with his extensive academic background in movement science, cybernetics, neurolinguistics, and psychobiology. 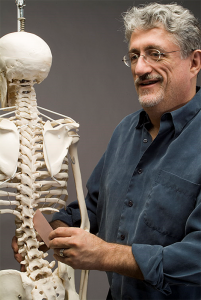 He has more than 30 years of private practice and experience teaching the method in many settings – including physical therapy clinics, rehabilitation centers, hospitals, workplaces, music conservatories, schools, and universities– to the training. Dr. Goldfarb – or, Larry as he is known among his students and colleagues –graduated from the Amherst Training Program (1983), the last teacher training in which Dr. Feldenkrais taught. He received his trainer accreditation in 1994. Larry studied with the founders of NLP, Richard Bandler and John Grinder, graduating from the last trainer training they ever gave together. Larry has taught in dozens of teacher training programs in Australia, Europe, and North America. He was the educational director of all of the accredited teacher trainings in The Netherlands as well as trainings in Adelaide (South Australia), New York City (New York), Santa Cruz (California), and Strasbourg (France). Not only does he teach the post-graduate programs internationally, including THE TRILOGY, which has been attended by over one thousand Feldenkrais teachers the world over, but Larry also established and directed the first Mentor training programs in the Method. Larry is highly regarded for his ability to articulate the inner workings of the method. Even more importantly, his students’ appreciate his patience and uncanny ability to tailor how he teaches to their needs and learning styles. Larry’s teaching is highlighted by clarity, warmth, individual attention, and the creation of the lively conditions for learning. His teaching is based on decades of experience in private practice, in rehabilitation settings, and with people on the job, including professional dancers, bank tellers, bus drivers, computer users, gardeners, orchestra musicians, stock clerks, and visual artists. Even with his busy teaching schedule, Larry maintains an active private practice in Santa Cruz, California. Combining extensive experience and deep knowledge with an equally profound concern for each student’s learning, Larry has guided hundreds trainees on three continents to becoming teachers of Moshe’s method. As educational director of the AIFTT V, Larry is responsible for maintaining the pedagogical integrity of the training. Working in conjunction with Caro van Iersel, the co-director of the program, he develops the curriculum, manages the faculty, and maintains an overview of each trainee’s progress. The rest of the faculty of our program consists of some of the most innovative and dedicated accredited Feldenkrais trainers from around the world – Angelika Feldmann (Switzerland), Susan Hillier (Australia), Alan Questel (USA), Katrin Smithback (NM, USA), Stephanie Spink (Australia), and Arlyn Zones (CA, USA) – and international Neurolinguistic Programming trainer Nicole Schneider (The Netherlands). Each Feldenkrais trainer brings the program’s curriculum to life by presenting Awareness Through Movement, teaching hands-on skills, doing demonstrations, giving Functional Integration lessons, clarifying concepts, leading discussions, facilitating small group exercise, and working closely with individual trainees. Nicole expands your learning beyond the standard training to help you more fully understand the process of change and to learn the communication and coaching skills needed to foster personal growth. The program’s co-director is Caro van Iersel (Netherlands), who is an assistant Feldenkrais trainer and physiotherapist. Along with Larry, she has been involved in the organization and teaching of all the Amsterdam trainings since their inception. The core teaching staff also includes tutor teachers, highly experienced and highly qualified Feldenkrais teachers from around Europe who give FIs during the training and support trainees between segments. The AIFTT V includes 160 days of training. The tuition for the first 80 days of the program is €110 per day and €125 per day for the second 80 days for a total cost of €18.800. The international Feldenkrais training accreditation guidelines state that a training consists of four years of training, each of which consists of 40 days of training. So that you complete the AIFTT and start practicing as soon as is reasonably possible, our class schedule consists of more than 40 days of class per calendar year. As you know from reading this document, our emphasis is on individualized training, one in which the faculty and the Educational Director follow your personal learning process. This means that supervision and support, both directly, in relation to developing skills, and indirectly, in terms of ongoing interactions, is inherent in the training process. Therefore, your progress is supported and your learning is guided throughout the AIFTT. Our personalized approach and emphasis on small group learning makes it possible to monitor your progress through the training in a collaborative and supportive fashion. This means that we can identify areas where you lack knowledge or ability, develop a plan of action, and follow up as you implement that plan. Continued participation in the AIFTT V is contingent on the way in which you participate in the training, including how you interact with your fellow students, with the staff, and with the faculty. Continued participation in the AIFTT V is contingent on the way in which you conduct yourself during the training. When you enroll in the program, you agree to comply with all rules and directives of the administration, its officers, and representatives, including the faculty. Should you exhibit any unacceptable and unprofessional behavior that disrupts the learning process for yourself, or for others, or should you demonstrate an inability or unwillingness to complete assignments and/or learn the required materials, we will address the matter personally and immediately as is reasonable and appropriate. Only after two or more such attempts fail do we start to consider dismissal. In the unfortunate event that such action be deemed necessary, we believe it is most fair to you and the rest of the trainees to act as early in the program as possible. You become eligible to be authorized to teach group Awareness Through Movement lessons, on a provisional basis, after successfully completing the first two years of the program. If you drop out or are terminated from the program after two years, but before graduation, you lose the right to teach Awareness Through Movement lessons, unless you have requested and received a leave absence from the administrator. Such a leave of absence is contingent upon your continued participation in the AIFTT V or another accredited program. To be eligible to graduate requires that you have paid your tuition for the training in full and that you attended class throughout the program. If you miss up to 5 days in any training year or up to 10 days over the course of the entire program, you are required to make up lost time and content in a timely fashion before being eligible for graduation. Tuition will not be reimbursed nor credit granted for any missed days or parts thereof. Should you miss more than 5 days in any one training year or more than 10 days over the course of the entire program, you’re required to make up by reviewing the recordings of the days you missed and writing a log. If you miss 5 or more days in a row, you have to make up at least half of the time in live training, which could include attending another training program at your own cost. Also, to ensure that you’re ready to teach the method, we reserve the right to ask any trainee to receive further training before being considered for graduation. You will be authorized to teach individual Functional Integration lessons only after successfully completing and graduating from the AIFTT V. Graduating from the AIFTT requires in-class demonstration of the ability to teach Awareness Through Movement and give Functional Integration lessons as well as full participation in the training, including completion of a community-based project. Upon successful completion of the program, you will be authorized and qualified to practice as a Feldenkrais teacher1. At this time, you’ll receive a certificate of graduation2 that makes you eligible for membership in all Feldenkrais Professional Associations or Guilds recognized by the International Feldenkrais Federation and to apply for status of "certified Feldenkrais practitioner" from one of those organizations. The laws of a given country or state may vary with regard to the use or application of the movement lessons and procedures taught in the AIFTT program. You are solely and entirely responsible for making your own inquiry regarding all local laws, licenses, and regulations that may affect your ability to practice the method, both in terms of teaching group classes and giving individual, hands-on lessons. Any additional requirements that must be met in order to practice in a specific city, state, or country are entirely and solely your responsibility. Mind in Motion, its officers, employees, and representatives make no representation or warranties concerning the uses or applications of the movement lessons and procedures taught in this program other than that the program has met all requirements for accreditation by the European Feldenkrais Training Accreditation Board. For information about the practice of the Feldenkrais Method of movement education in any specific location, please contact your local professional association or the International Feldenkrais Federation. 1 Feldenkrais, Feldenkrais Method, Functional Integration, Awareness Through Movement, and the Feldenkrais Logo are registered service marks held by the FELDENKRAIS GUILD or professional Association of most countries. This being the case, the trainee contract requires the trainee to follow the guidelines regarding the use of service marks established by the Guild or Association of the country or countries in which he or she resides or practices.2 Your eligibility for membership in a professional organization is dependent on the AIFTT V receiving accreditation, which we fully expect to obtain. 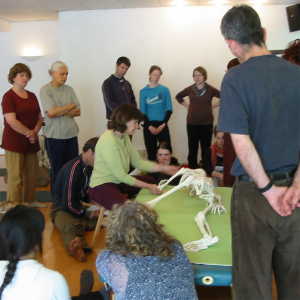 The Amsterdam International Feldenkrais Teacher Training is a professional training program, that is to say, one designed to prepare participants to become Feldenkrais teachers. 1. Have prior Feldenkrais experience (individual lessons, group classes, or, preferably, both). 2. Participate in an introductory workshop or an application interview. Given our interest in having a diverse group of trainees, applicants will be selected from a wide variety of backgrounds. We screen applicants according to their interest in the Feldenkrais Method as a profession. We also evaluate the contributions they can, potentially, make to the practice and development of the method. We are committed to accepting people into the AIFTT regardless of race, gender, religion, physical limitation, age or sexual orientation. After submitting your AIFTT V application, you can expect to find out if you have been accepted within a week’s time. If you’re accepted into the program, you will receive orientation information along with a trainee enrollment agreement. The agreement is the contract that specifies your rights and responsibilities as a participant in the program. You will be asked to sign the contract and return it, along with a current photo and a deposit to reserve your place in the training, within 10 days. To apply, please complete and submit the application form, along with your letters of recommendation and the €85 application fee. Please note that this application fee is non-refundable.